Extremely heavy rains warning is in place for isolated parts of Assam and Meghalaya. Heavy to very heavy is also expected over parts of Northern plains and rest parts of North East India. Tamil Nadu will continue to get thunderstorms with rain and is expected to become more widespread over the next two days with possibility of isolated heavy rains. Slight Dip in temperatures can also be expected during the next two days. Kerala and coastal Karnataka can expect heavy rains due to an UAC persisting off North Kerala and Karnataka coasts. Andhra Pradesh and Telangana region is expected to have only scattered rainfall activity over the next day or two. Chennai – Generally cloudy sky with the maximum of 33 to 34 degrees and a minimum of around 27 degrees, thunderstorms with rain can be expected towards late evening/night. Madurai – Partly cloudy skies, maximum may see a slight dip to settle around 36 to 37 degrees with a minimum of 25 degrees, thundery development towards evening. Trichy – Cloudy sky with a maximum of 34 degrees and a minimum of 25 degrees with chances of moderate rains/thunderstorms. 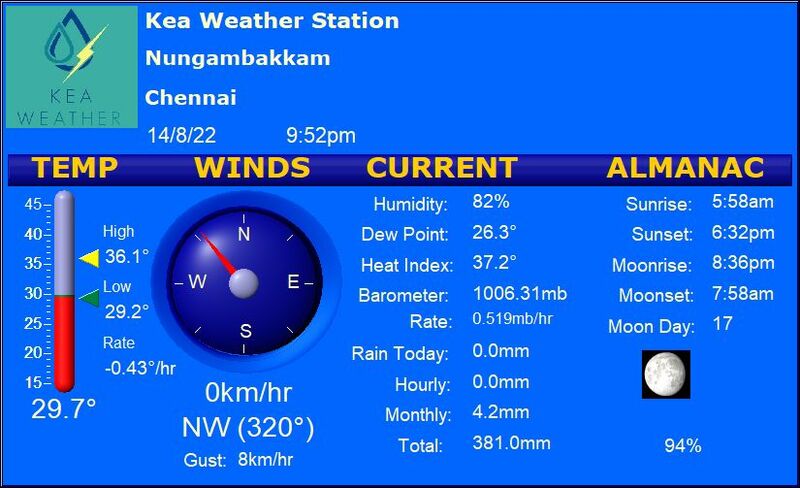 Coimbatore – Yet another pleasant day with maximum of 32 degrees and a minimum of 23 degrees with light rains. Vellore – Generally cloudy sky with maximum of 35 degrees and a minimum of 25 degrees with late evening thundery development.